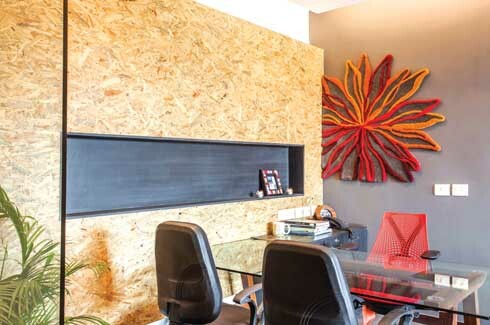 How do you react to an office that has no fixed reception area and boasts a settee fabricated from rubber ‘chappals’? According to AVA Design Studio, this project is all about creating an atmosphere of surprise. 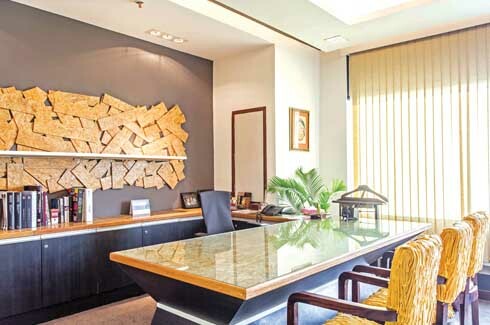 The impression that you are in an unusual workplace descends upon you right from the moment you set foot into the office of Sharda Exports, a home-furnishings company in Noida, Delhi. Rugs on the floor, ceiling and wall cleverly showcase the client’s product range and creativity. The ubiquitous reception desk and lounge area are conspicuous by their absence, and in their place a hip bar counter, bar stools and an assortment of chairs occupy the meeting area. Suspended above the counter is a chandelier pieced together from discarded soda cans while a huge mural of a jungle scene stares out of the adjacent wall. Clearly this is not a scene from a typical workplace. 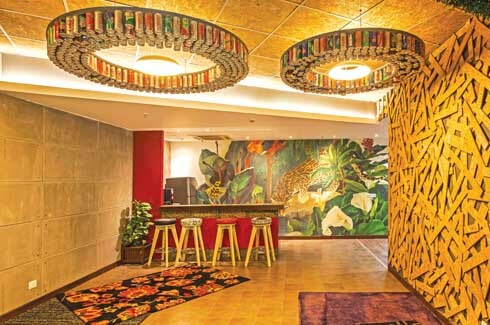 “The idea was to create an element of surprise”, explains Vistasp Bhagwagar, Chief Architect and MD of AVA Design Studio, who was roped in to design the corporate office of Sharda Exports. When the client asked the design studio to explore the theme of ‘reincarnation’ for the interiors, the team interpreted this as giving a “second life to discarded materials”. Old soda cans, for instance, were given a fresh lease of life in a lighting fixture and discarded scooter tyres and cycle spokes were upcycled into barstools. 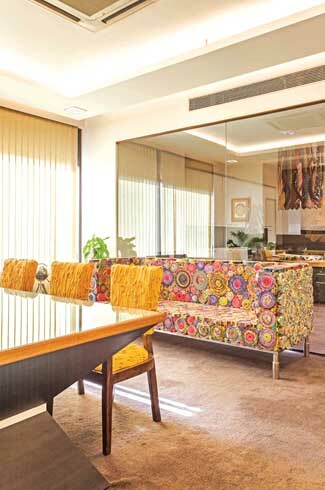 Waste yarn from the client’s carpet factory was not only used to create green carpets for the ceiling but was also creatively woven to upholster chairs in the MD’s office. However, the design feature that grabs most eyeballs and is the pride of the export firm is the huge multi-coloured settee entirely fabricated from the soles of rubber ‘chappals’. Vistasp candidly admits that the settee takes inspiration from the collection of designer duo – Campana Brothers. But not everything here is all form and no function. The office entrance area was designed to look like a café with a bar counter not just for design’s sake but in order to maintain a flexible space where the export firms’ rugs could be spread out and displayed when necessary. In the conference room, a wall covered with 600 pegs suggests an abstract installation, when in fact the pegs are a handy medium to display rugs and samples when the firm’s designers are brainstorming or meeting a client. 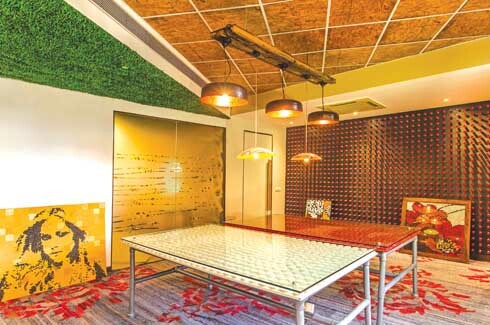 In a league of its own, this office takes delight in the surprised expressions of first-time visitors who step closer for a second look at the upcycled barstools or the rubber chappal settee. It’s hard to ignore the numerous carpets and rugs that line the floors and in some cases the walls and ceilings too. 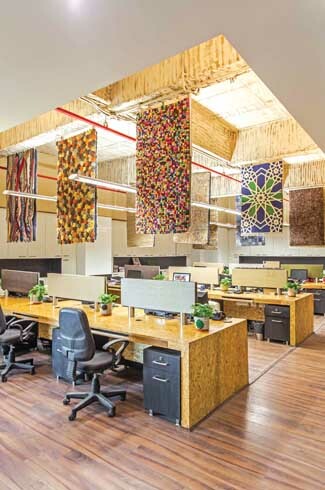 These rugs and carpets were created by the export firm for the office area and cleverly showcase the company’s capabilities while also adding interesting dimensions of colour and texture to the interiors. Fibreboard, one of the unifying elements in the office is seen everywhere, right from the entrance area to the office desks; it reinforces the concept of ‘reincarnation’. 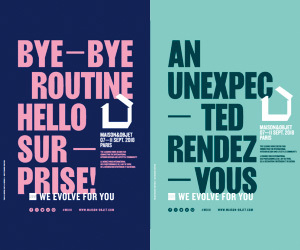 “We’ve attempted to bring back respect for all that is simple and non-glamorous”, points out Vistasp referring to elements like the tiles in the washrooms that are an odd assortment of leftover stocks and are prudently utilised to create an abstract collage. One of the main challenges of working on a project like this was finding artisans who were willing and had the skill to fabricate the unusual designs drawn up by the team. Vistasp acknowledges, “Creating out-of-the-ordinary furniture and accessories requires tremendous patience. It also means stepping out of your comfort zone and dealing with carpenters and labourers who have no previous experience of dealing with unusual materials.” For their patience and effort, AVA Design Studio was awarded a ‘Special Mention for Corporate Interiors’ at the IID Anchor Awards, 2013.